Mountains generally consist of rocks, and rocks are made of stone, so it just seems natural that the Alps should be a good breeding ground for stoner rock bands… or not? 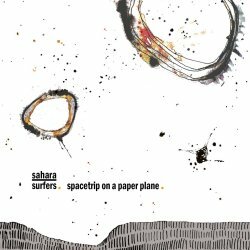 Actually Austria is not necessarily the first place I’d think of when it comes to that genre, but Sahara Surfers, a quartet from Innsbruck, is unimpressed by preconceptions and delivers a good half hour of crunchy stoner rock throughout the course of six songs. But don’t worry, you are not in for another lesson in Kyuss or QOTSA, instead the band has adopted psychedelic elements to lighten up their sound, and vocalist Julia Überbacher, one of the rare female front-people in stoner rock, also helps Sahara Surfers to flesh out their own sound. The songs are between three and six minutes long, stay most of the time in mid-tempo territories, which gives the musicians ample space to build tension. The deep, slightly monotonous vocals fit the nonchalant atmosphere of this band that sounds as if they came from somewhere much warmer than they actually are. At times you might want them to maybe experiment a little more, maybe dig deeper into their psychedelic veins, but the transparent production in combination with the not overly long running time prevent the listening experience to drag. Considering that we are in the presence of a self-produced debut that the band if furthermore offering as a free download or alternatively a really not very expensive physical purchase, fans of desert rock can’t make anything wrong by checking out these newcomers from the mountains. I am already looking forward to what this hopeful artists will be capable of in the future.